As the IASB’s due process sustains, the national standard-setters play a key role in the development of IFRS. There is still much to learn, however, about their lobbying practices, which arguments they use and when they do it. 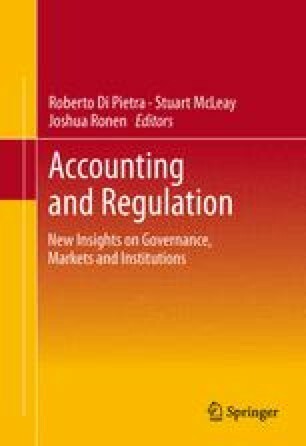 This chapter focuses on the accounting of share-based payments that were under-regulated before IFRS 2. To analyze lobbying behavior of this relevant group of stakeholders, we conduct a content analysis of the 27 comment letters addressing the documents issued by the G4+1 and the IASB that preceded IFRS 2. Consistent with institutional theory, our analysis of lobbying activity by national standard-setters shows that participation increased at the end of the process, and they supported the IASB’s final proposals although they were not as much supportive at the beginning. EFRAG (European Financial Reporting Advisory Group). (2005). Achieving consistent application of IFRS in the EU: A discussion paper, EFRAG, Available at: www.efrag.org. Perrin, T. (2004). Companies pursuing major changes in executive pay strategies http://www.towersperrin.com/hrservices/global/default.htm.